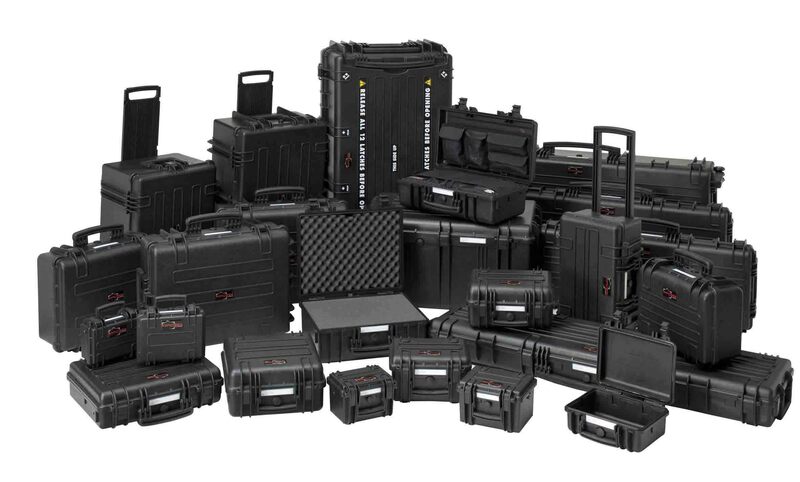 Henchman Products is The Australian Distributor for Explorer Cases. The Explorer Cases are heavy duty, virtually indestructible, durable and waterproof transit cases (IP67) providing a solution for any equipment requiring a high level of protection. A lot of careful consideration, thought, time and extreme testing has gone into designing each and every one of the Explorer Cases giving a large number of features making them the superior transit case. Each Explorer Case has been fitted with counter balance supports to prevent the case toppling backwards when the lid is opened, especially if he lid has been fitted out. The Explorer Case range covers a wide range of transit cases from small to very large. The smaller versions are ideally suited to the storage of instruments or cameras and can be used as a rugged housing for building test equipment into the transit case. Larger versions suit computer and even heavier equipment where the cases are required to have wheels. Some of the small to medium Explorer Cases have a removable lid, which slides off in a certain open position when grub screws are loosened. This is ideal for building equipment into the case without the hindrance of a lid. Panel supports are available in metal or plastic to avoid drilling through the case if panel mounting is required. Some of the Explorer Cases are fitted with self oiling free running wheels and pull out handle. There is no doubt, Explorer Cases are the rugged case of choice. The Explorer Cases have been subjected to a series of controlled laboratory tests to prove their suitability for use in the most extreme and hazardous applications and insure they meet the exacting standards of: IP67 Dustproof – Waterproof; Defence Standard 1-41 Level J; STANAG 4280 (edition 2); Conformity with Directive 2002/95/EC. Applications for Explorer Cases range from Military, Emergence Services and Aerospace to Computer and Equipment cases while their dust and waterproof qualities offer absolute protection making them ideal for use in the harshest environment. No matter what human being, animal or fish you come across in your life or journey Explorer can withstand the most rigorous situations. Wide range of sizes, Explorer Cases actually has the largest waterproof case on the market. Explorer Cases have a warranty against breakage of materials and defects on workmanship that could affect the integrity of what you carry inside . Explorer Cases are available from explorercases.com.au in a large range of sizes and are available in Black or Orange as standard colours. Olive Green is available as a stock colour in Italy. Any colour can be produced if a specific colour is required but generally this would require a minimum order of 50 cases and would need to be discussed with one of our team members. Personalizing the interior of your Explorer Case is easy, with the clean interior lines providing the ideal case for foam converters and custom foam which is pre-cubed foam allowing the user to tailor the insert to their own individual requirement. Henchman is experienced in custom foam cutting. We can supply you with a high density custom CNC router cut foam to suit your personal requirement.